Another great comfort food, and very easy to make. This is a tasty way to serve chicken and vegetables. Germans love different variations of gulasch, and this is one of my favorites. This can be served with boiled potatoes or noodles, and a steamed vegetable. This is a fairly simple, yummy dish. It is also forgiving. The picture you see is a version I did with leftover turkey (sloppy looking, but yummy). You can also add mushrooms, or mix peas in the sauce, etc. This is now a staple in Germany, but was adopted from Hungary. Veal cutlets are a popular way to prepare veal, and usually combined with a sauce, which can vary from region to region. They can also be prepared and eaten on bread, or as an entrée without sauce. Preparation Time: 1 h 30 min. A pork roast traditionally served with a mild sauce, red cabbage, and potato dumplings (Kartoffelknödel) in the South, or peas and boiled potatoes in the North-East. 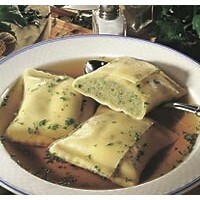 Preparation Time: over 2.5 h.
This is a very easy dish, particularly popular in Bavaria. It is a great comfort food, and takes very little work, and few ingredients.